The Final Jeopardy Category is Hyp(e)ocrisy. After almost two and a half centuries of masquerading as a gleaming bastion of freedom and sterling example of a nation where all men are created equal, this country’s government was accused of implementing a system of institutionalized discrimination, blatant police brutality and a host of other international human rights violations by the same UN panel it helped establish to, er… protect human rights. 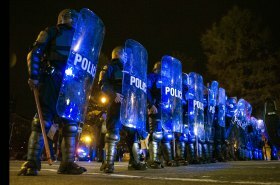 U.N. Panel Sharply Criticizes Police Brutality in U.S.